Squash House Quilts: Honey....Have you seen my Canoe Shirt? Well, yes, as a matter of fact, I have! This is was Mr. Squash's favorite shirt for many years. It has had little canoes and oars on it and is was very soft. He wore it so much that the collar nearly detached from the shirt and there were numerous little repair spots, so I tucked it away and hoped he wouldn't ask where it was. This was about 6-7 years ago. Of course he eventually asked where it might be, so I made a lot of excuses about it needing repairs and having no time to make them. The following Christmas I repaired it and wrapped it up as a present! He was thrilled! Then the repairs finally gave way and for some reason I put it away in my scrap fabric basket. You guessed it....he asked about it again recently. I sort of indicated that it might have gotten "lost" in the move, but I'd find some time and look for it, even though I knew where it was all along! Yesterday I was going through my scrap basket looking for some old pattern instructions and I came across the shirt. The basket was so stuffed that I decided it was time to remove the shirt and either do away with it or make something fun. So here is the reincarnation of the Canoe Shirt! Mr. Squash is delighted! I even left the pocket open in case he needed to stash a cookie or his reading glasses or something else in it! Now he can sit in his chair with an old friend! How sweet and thoughtful AND smart. That was a great idea, Candace! Now, Mr. Squash will be able to enjoy or years to come! Isn't funny how guys will out of the blue ask for where something is like that?? Lol! How fun :) I'm glad he didn't lose his favorite shirt forever! I absolutely love that. What a perfectly thoughtful solution you came up with! Love it! What a cute idea. He's kind of like a kid with his blanket. I was afraid you were going to tell us he wasn't happy with what you did to his favorite shirt.Clever Candace! What a perfect solution! I love that you left the pocket. 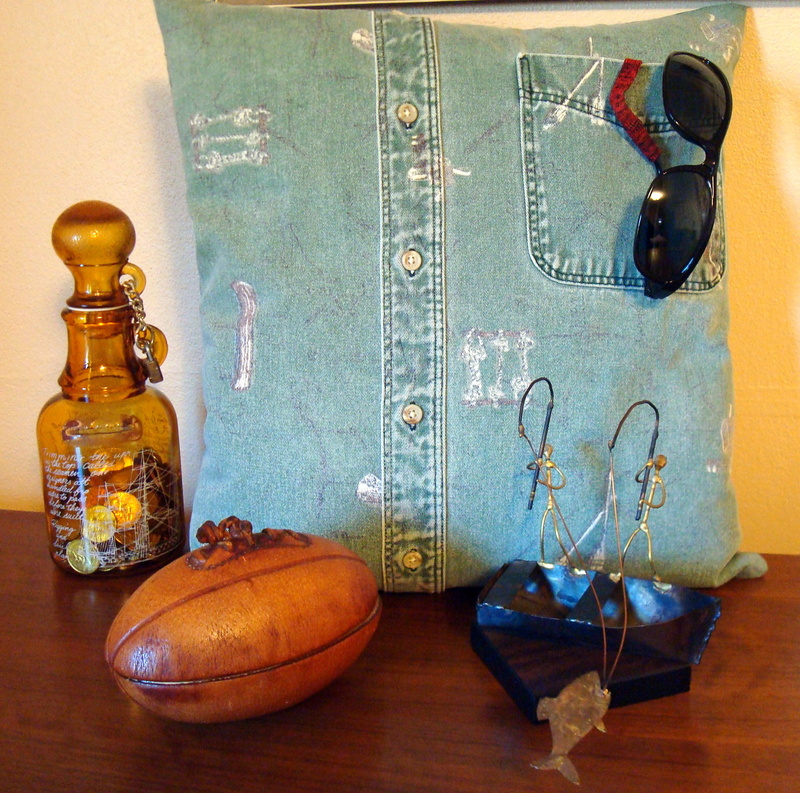 Doesn't it make you feel great to refurbish something and make it wonderful, love your pillow. What is it with men and shirts? My husband will keep wearing them when they are no longer fit to be dusters. The other day I told him that one of his shirts is no longer fit to be worn. He said 'it will do for gardening', I said 'no' I'm having it to put it in a quilt, in fact I've got my eye a lot of his shirts for quilting, then we will both have something to remember his shirts with. The cushion is a really good idea. How wonderful Mr. Squash has a new use for a very old shirt! Clever Mrs. Squash!!! What a sweet idea, this certainly made me smile! Great idea and what a fun thing to do with his favorite shirt. 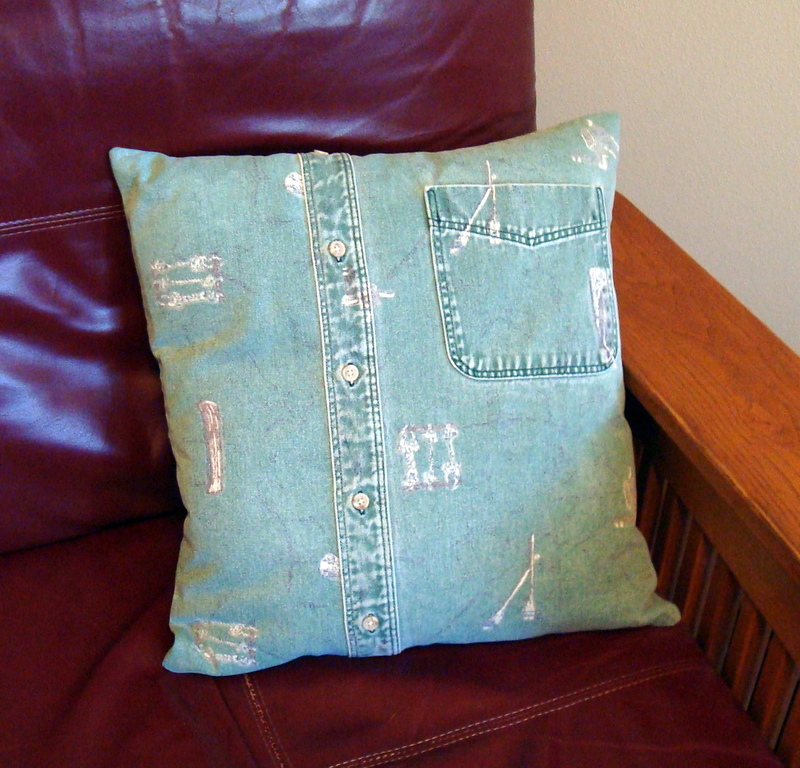 Great pillow, what a terrific idea. Have a great week! Well done! From now on you must pay attention to his choice of new shirts so they will be useful for quilts in their second life. Matching colours, nice small prints etc. I have many years of experience guiding Mr. K.
I think all of our husbands have a shirt that they can bear to part with. What a perfect solution! You're so clever! How cool is that, Candace!!! I guess we all have our favorite 'security' blankets. I know I do! Very smart of you to leave the pocket Candace. Now if Mr. Squash happens to loose a tooth, he has just the right pocket to put it in so the Tooth Fairy can leave money! It is a heartwarming present one that'll stay close to Mr.Squash and can be enjoyed for many more years. It is cute! I love it Candace, so cute and he can always have his favorite shirt. Great idea Candace. 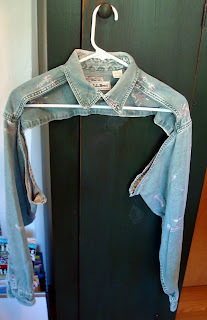 I once did something similar with my hubs old Levi jacket! Very clever!! What a great way to save a favorite shirt! Great idea! My husband has a few shirt like that but he just keeps on wearing them to work in. What a cute idea for saving your DH's favorite shirt! Wonderful idea! There are some items of clothing you do get attached to and this is a lovely way of preserving their life a little longer. I'm sitting here LOL !! !